Rakshi has become such a mass affection festival in Orissa that, nobody will accept that, it is, by origin, not an Oriya festival. In the process of acquiring this popularity, Rakshi has almost replaced Orissa’s traditional fest Gamha Punei celebrations. Gamha Punei celebration is the culmination of paddy growing activities in Orissa, the land of rice. Orissa celebrates Raja (Menstruation cycle of Mother Earth), when, with advent of the rainy season, the soil in heat due to summer, earns maturity to be sowed with the seed of paddy. Symbolically, the lady of Srimandira – the epitome of the matriarch concept of Buddhism, the concept of creation caused not by Bramha, but by copulation, Sri Jagannatha – also gets the Raja treatment spanning from Snana to Nava Jouvana Darshana, typically like a Oriya girl having her first menstruation, particularly in a farmer’s family. Under the sway of such matriarch concept, women folk of farmer families play a major role in shaping social ceremonies. On the full moon day of Shravana, they treat the Oxen (Balada) as their brother with whose help the farmers cultivate the fields. Process of cultivation starts on Akshi Trutiya. Wife of a farmer puts the seeds of paddy in Akshaya Gauni and sends her husband to the field with the oxen to plough and sow the seeds. From that day till all the phases of paddy growing – Bida, Bihuda, Bachha, khelua, Beushana, Rua – are over, the oxen do not get adequate rest. By full moon day of Shravana, all these phases are usually over in Orissa. So, on the last day of Shravana, the wife of the farmer conveys formal gratitude of the family to the oxen with tasty cakes she prepares from the best of the cereals and feeds the oxen while greeting them as her brothers; because, like a brother does not hesitate to help his sister even if that requires physical hardship and strain, the oxen perform all the hard works of cultivation for prosperity of her family. Every year, on the full moon day of Shravana, wife of an Oriya farmer renews her bond of affection with the oxen, fastening strings of flower on their horns. This great occasion unfolds the unique Oriya philosophic concept that female factor is the presiding factor of life. This being the greatest challenge to patriarch supremacism propounded by Vedic philosophy, not only Asoka had tried to destroy Orissa, but also Vedic chauvinists like Shankaracharya had flocked to Orissa to impose the patriarch god Brahma on the people of Orissa. In this process, they had contrived a legend that, a powerful demon had obtained a boon from Bramha that he can devour any number of human beings as he would want to satisfy his hunger on the full moon day of Shravana. As panicked people prayed God to save them from the demon, they were advised to become a Brahmin on that day, as the demon – Bramha Rakshasa – being a devotee of Bramha will not kill any Brahmin. So, on this day village Brahmins distribute Paita (the thread that the Brahmins wear) amongst all the members of farming families, against Dakshina (money or rice and vegetables they collect against the said service). Thus, on this day, the entire population of Orissa become a Brahmin population. And, though this is only for a single day, the concept of Brahmin as a protector gets implanted in the mind of the people, the Brahmins were thinking. When, therefore, to solidify the impression, they were calling this day as Bramha Parva (Festival of Bramhinisation) the farming people of Orissa, who by birth are anti-caste-divide, were mocking it as Gamha Parva, linking it to Gamha Poka (a silky white insect that damages the paddy) and the tread the Brahmins were instigating the people to wear being called Gamha Paita. Till my childhood days, this was in vogue in my birthplace Tigiria. It also continues in many places of Orissa till date. And, Srimandira of SriJagannatha continues to be place of no Brahminism. Many fights the people of Orissa have fought against caste supremacism and have heroically revolted against their own emperors like the patron of Brahminism Purusottam Dev, forcing him to withdraw his own book Abhinav Gita Govinda wherein attempts were made to transform Jagannatha from Buddha – the nullifier of caste divide – to Bishnu of caste-supremacism. In their fight against caste supremacism, the people of Orissa, history has witnessed, had dragged out the statue of Adi Sankara from Ratna Singhasana of Sri Jagannatha, where Purusottam Dev had consecrated that to be worshiped along with the deity and thrown the same to the dust where people were discharging their urine. Since then no Sankaracharya had dared to poke his nose into affairs of SriJagannatha, though this year the religious revivalists taking advantage of educated Oriyas running away from the agro-traditions, had tried to get him implanted on the horizon of Jagannatha. However, having failed in the Brahminisation trick, the Vedic chauvinists had devised ways to project Jagannatha as Krushna, whose character depicted in the misleading Mahapurana Bhagavata was akin to that of a Sahaja Nayak perceived in Sahajayana of Buddhism, with a motive to slow-poison Oriya psyche to accept Jagannatha as Bishnu, in which name, Krushna was also projected. And, in this nefarious design, in order to wipe out the image of Krushna as a hero of class war, who, in Mahabharata, had given clarion call to wipe out the self-styled Aryas, who in the name of Vedic religion, were, by force, taking into their possession others’ properties including wives, they started Jhulana yatra with Jagannatha projected as a promiscuous lover of many women including Radha. The aim behind this was to show superiority of man over woman, to counter the matriarch effect of Buddhism in the Srimandira system. People of Orissa foiled this design by providing for worship of the image of Anangatura (woman eager for copulation) which mocks at the Mukti Mandapa, a podium the Brahmins have erected for imposing their supremacy with the help of their patron king. The so-called Jhulana is being executed in the side of this Mukti mandap, in the outer campus of Srimandira, till date. Inter alia, in the design to transform Jagannath from Buddha to Krushna, they have added Balabhadra and Subhadra of Dwaraka to the system of Jagannatha Buddha. And, to eliminate the Gamha tradition, where women of farmer families were renewing their bond of affection with the Balada (oxen) treating them as their brothers, legends of Subhadra tying Rakshi in Barabhadra’s hands were introduced. Balabhadra being Haladhara (whose distinction is based upon plough) is not different from Balad (oxen) that females of farmer families so lovingly accept as brothers. Therefore, the legend of Subhadra renewing her bond with Balabhadra with tying the Rakshi has not been rejected by the Oriya population. Thus the strings of flower tied on the horns of oxen by women in farmers’ families on Gamha Punei (Full moon day of Shravana) have, by extension, merged in sisters renewing their bond with brothers putting Rakshi in their hands. But my family being a proud family of farm land owners is yet having the oxen greeted in traditional method and my sisters by birth have never been encouraged by my parents to tie Rakshi on my hand. But I have a sister in Laxmima Sircar, to whom, since her childhood, I am the elder brother, being adopted as a spiritual son of her most revered parents. 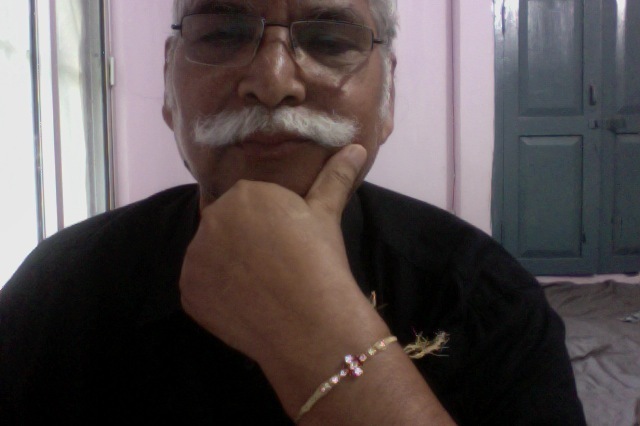 Her Rakshi is always tied to my hand on this day every year, even though she is living in Ranchi. It never happens that the full moon day of Shravan arrives and Rakshi from Laxmima has not reached me. And, every year this is the only Rakshi I wear. This year, it did not come in time. The sun rose in the morning of Shravana Purnima as usual. The clock proceeded into 10 AM. I felt hungry, as I was waiting for Laxmima’s Rakshi so that after a bath I would take it and then have my breakfast. I telephoned her and she became instantly worried on hearing that her Rakshi has not reached me. I decided to procure a Rakshi in her name and wear the same in her name. But that was not to happen. As I was going to ask my nephew to purchase a Rakshi on behalf of Laxmima, the postman entered into my campus and delivered me the speed post carrying her Rakshi, with her letter that she sends every year on this occasion, full of affection. Rakshi, to me, is entirely sister-centric, despite attempts to make it patriarch. It has become a great event in agrarian Orissa, despite not being an Oriya festival by origin. Great article. Very educative and an eye opener for me.. Most of the people outside Orissa do not know these facts.